On September 25, 1942, Shirley Ann Guzman was born in Ybor City, Tampa, Florida. She was the third of nine children born to Rene Guzman and Vivian Guzman Branch (nee Hudson). Shirley attended Meacham and Lomax Elementary Schools and Booker T. Washington Junior High School. Shirley attended Middleton High School where she was a Lead Majorette for the marching band and a member of the Homecoming Queen’s court for two years running. Shirley graduated in June 1960. On December 27, 1960 Shirley married the love of her life, and was the mother of four children by April 1965. She and her husband began raising their family in the military, taking them from Tampa, Florida to Fort Dix-New Jersey, to Orleans-France, to Fort Benning-Georgia, to Fort Hamilton-New York, to Butzbach-Germany. Shirley was a dedicated military housewife and worked as a part-time Secretary while living at Fort Hamilton. With raising a Godly family as a priority, Shirley and Willie found a home at St. John’s Episcopal Church, Fort Hamilton. Shirley served on the alter guild and sang in the choir. Shirley was involved in many other activities, especially those that included the entire family. It was the second time in New York, after leaving Germany in 1974, when the Black family made Staten Island their home. After settling in, Shirley began work in the rental office of Park Hill Apartments where she and her family lived. Shirley worked for Uniforms by Ostwald when her family moved to Stapleton – there she coordinated a summer youth program and supervised her eldest son among other Young Leaders of America. When it was time to further her career, Shirley began a Secretarial position with the City of New York. Shirley was a dedicated employee, working in only two different offices, the first in lower Manhattan. Shirley retired as a Legal Secretary from the Administration for Children’s Services, Staten Island after 30 years with the City of New York. The Black family moved to their permanent residence in Clifton in 1977. Shirley maintained her first priority career throughout her Secretary career – she was always a dedicated wife and mom. Her home was the place where all the kids came to. She attended every activity where her children were involved, even as they became adults. From sports to concerts to school activities and trips, you would always find Mrs. Black. Shirley was fondly known as Momma Black to her husband’s track team and extended family. She and her husband attended St. Simon’s Episcopal Church, Staten Island where she also sang in the choir before attending and calling her current congregation, Christ Church New Brighton, home. In addition to assisting in planning and cooking for events of the church, Shirley served on the alter guild and sang in the choir. 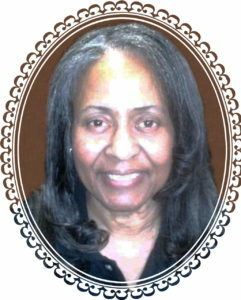 Shirley is preceded in death by her husband of 55 years, Willie Franklin Black, Jr. and by her son, Andre’ Juan Black. She leaves to mourn her passing her son, Willie Black III and his wife, Connie; her daughter, Cheryl and former husband William Marshall Sr; her daughter Katrina and husband Gregory Watkins Sr. She also leaves her grandchildren Willie Black IV, Eva Marie Black, William Marshall Jr and his wife Danielle, Kachiri Marshall, Owen Marshall, Gregory Watkins Jr. and his wife Lindsay, Kyle Watkins, Garrett Watkins and Kharlin Watkins; her great-granddaughters Isis Johnson and Cadence Marshall. Shirley also leaves two sisters, Marie Guzman and Margaret Guzman Woodie, one brother, Costello Guzman, a host of nieces and nephews, as well as many friends near and far. Our prayers and sincere condolences to the Black Family. May His peace give you comfort in this time. Weeping may endure for a night…but JOY will come in the morning. My dearest cousins you all have my deepest sympathy in the passing of your beloved mother💔 Late. Much respect and love to you all and for all the good works you’ve accomplished! Mourn well and often while you reflect on the blessing she gave you. My sincere condolences to your family. Though she may no longer be here physically, her spirit will live on in all of you.